In this episode Shahriar takes a look at one of the most advanced electrical test and measurement instruments ever created. 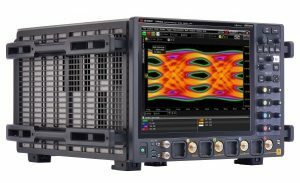 The Keysight UXR-Series Real-Time Oscilloscope brings 110GHz of analog bandwidth and 256GS/s real-time sampling at 4-channels simultaneously. To make it even more impressive, the entire data-conversion architecture is in 10-bits. This implies that the instruments captures, processes, stores and displays over 10Tb/s of information. Various architectures of state-of-the art oscilloscopes from Keysight, LeCroy and Tektronix are examined and compared against the new real-time architecture of the UXR-Series oscilloscope. The teardown of the front-end 110GHz module along with the data acquisition board is presented and analyzed in detail. The instrument showcases a wide range of Keysight technologies implemented in various technologies such as InP, SiGe BiCMOS, 65nm CMOS and 28nm CMOS nodes. In combination with Hyper-Cube memory module, data can be captured at 256GS/S from all 4-channels at the same time. Several variants of the UXR-Series oscilloscope will be available from 13GHz to 110GHz bandwidths. A new calibration probe is also introduced based on the Keysight InP process capable of producing signal edges with sub-3.5ps of rise/fall times with NIST traceable calibration data. This enables users to perform NIST alignment and bandwidth calibration on site without needing to send the instrument back to Keysight. Several measurements with the scope demonstrates its extraordinarily low noise floor, jitter as well as the capability of the new probe module for instrument calibration. The 110GHz 4-channel variant of the UXR-Series oscilloscope has an MSRP of $1.3 Million US dollars. This is fantastic video. I have a new Keysight scope 2 channel 100 MHz with test signals and function generator. It is a fantastic step up for me from a basic and low speed analog scope. I am very impressed with Keysight’s products. Totally amazing! The USA leads again! As with all Keysight technology I wonder just who it is that does the actual design work on these instruments. A tour of the research and production facilities would be interesting, meeting some of the “magicians” that do the actual design of the I.C.s and other parts. I wonder if one of these incredibly intelligent and experienced people gets run over by a bus if Keysight is set back years due to nobody available to take his place. Another video on who is buying these scopes and what they are doing with them would be interesting. So in making these boards with the massive ball grid arrays what happens if you fire it up and it is dead? How do you determine what is wrong with so many places one single bad connection could mean disaster? Just make a bunch of them and keep the ones that work? Try to figure out which array has a bad connection? Totally perplexing to me! Fantastic tour and very well presented. 110GHz and 256Gs/S – who’d a thunk! Kudos to your review – extremely well done. And of course, kudos to the Keysight engineering team. When I think about the design challenges and barriers, and then the well thought out approach in the application of of the appropriate semiconductor process technologies at each stage, I’m thoroughly impressed. As an engineer who deals with the physics of millimeter wave RF and high-speed digital, this instrument exceeds what I thought possible. Thank you for a great evaluation of a fantastic technology! This is one beautiful piece of Engineering. Well done by all concerned. Truly impressive. Great video. I intended to just view the highlights, but it was so compelling that I watched the entire thing. Thanks for discussing the IC technologies used at each stage, including the calibration device. I also liked the noise measurement with nothing connected. It reminds me of a classic Joel Woodward video for other scopes. Thanks for the great signal path! They’re lucky to be getting 5.5 bit ENOB! Great video, thanks for this tour of a leading-edge instrument.